This Airon Marine 345 is quite decent for a boat her age. Although she could use a bit of TLC to get her back to her former glory, this is not disturbing for everyday use, as it consists in her varnish being slightly faded and a little cracked in some spots in the cockpit as well as small patches of carpet in both the saloon and master cabin needing attention too, but other than that she is in very good condition for a boat her age and has been priced to reflect these points. A new deckbar has been ordered and will be replaced shortly and the cockpit enclosure is brand new. 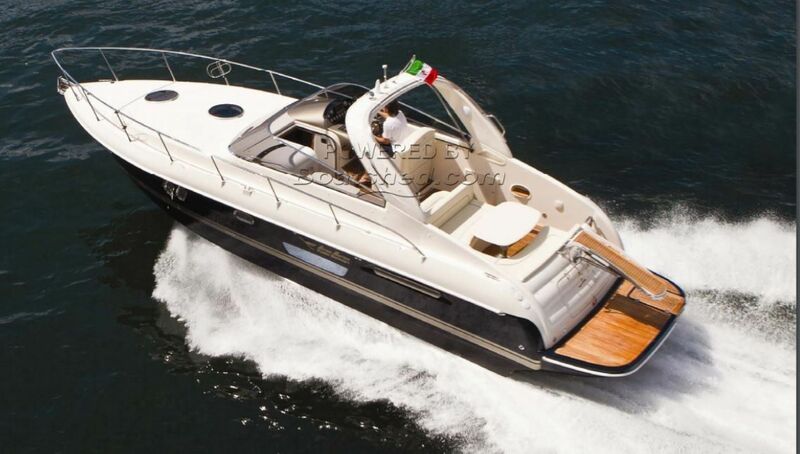 With her 2 spacious berths, one double and one triple, as well as a very spacious cockpit with two very large seating areas (one of which turns into full double sunpads to soak in the sun), she is ideal for cruising the Med comfortably with both family and friends. All service records are available and the boat has been serviced and maintained regularly. This Airon Marine 345 has been personally photographed and viewed by Solenne Vaudin d'Imécourt of Boatshed Riviera. Click here for contact details.